Yeah! This so cool I've all ready got it set up as wallpaper on phone! They gotta do something for the 29th anniversary come on Sony we want a game not art like Arc the Lad. OoH YES! The Crash Dance! All right the Crash dance. Believe it or not crash's dance was a household thing for my family when i was a small kid playing the games. 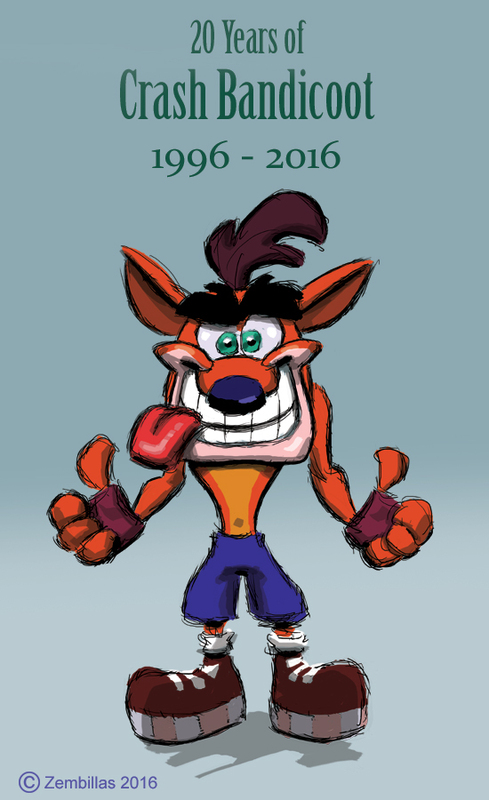 20 years, I'm gonna turn nineteen this year and I'm still gonna play Crash bandicoot countless times, and draw inspiration for the series i wanna create myself when i grow up. Yes something should be done to commemorate the 20th anniversary of Crash. It would really be a disappointment if Sony and others overlooked this special moment that's coming up. Vicarious Visions did a Crash model that is pretty much a 1:1 of your design! And they will make a Crash Bandicoot Remastered Collection! Charles, your art is amazing! I love your desings, and I admire you so much!!! I'm fan of Crash Bandicoot since I had 4 years old, and I always try to improve my art and really you inspire me a lot! I'm very happy to see Crash Bandicoot again, and I'm very anxious to see all the characters of this videogame. Thanks for inspire me always, and for give us the opportunity to see your art in this blog. Thank you Araceli Bandicoot MK for your very thoughtful message. I enjoy your character and I think the design is really good. She's very interesting and I can see a lot of potential for working her into the Crash story. I think she could be used to create conflict between Crash and Tawna and even Coco. Well done. You're a very talented artist. Thanks for checking in and good luck to you! Thank you too Joao for the link to the video. I see similarities in this version of Crash. Thank you very much for all, Charles. Really I'm very happy with your words, this is very important for me, and I'm delighted that you consider Ara! I feel that my dream is every time more near, I promise I will never give up to this! I like the idea that you gave me, really I will think how to add it in the story or a drawing scene, would be funny to do! I should think too how to do that she is on the good side later. After making several scenes in drawings, I have thought to add a second part in her history where she ceases to be a villain. I will wait to see more of your amazing art in this blog! Again, thank you and good luck to you! Gribouille that is an amazingly good video! You are doing some very impressive work! Thank you for the link I really enjoyed watching it. I'm going to make more animations.